HENEK's pleated water absorbing fitlers are designed for removal of water and particulates from petroleum products. The media is designed to absorb water from petroleum products and chemically locks it inside the media. When a cartridge starts reaching its holding load it begins to swell and cause an increase in the differential pressure which signals the operator to change the cartridge. The pleated accordion style design provides a large surface area for maximum dirt holding capacity. Models are offered for particulate filtration from 1/2 micron to 50 micron with 98% plus efficiency. Ideal for use in lubricating oil, hydraulic oil, and fuel systems. They can also be used in portable fluid conditioning equipment. 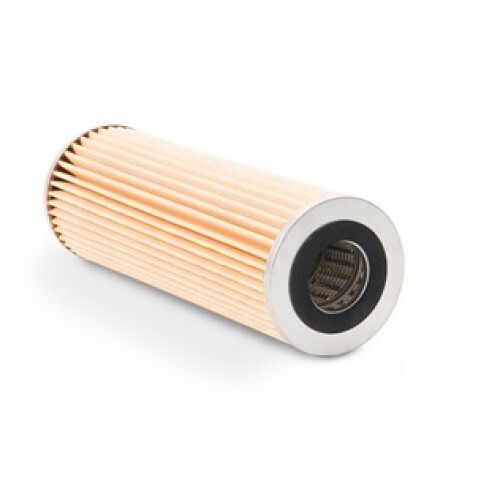 The filter elements are available in multiple sizes to replace existing filter cartridges up to 36" in length. HENEK is guided by a simple principle: to provide quality, long-lasting products at competitive prices. It’s this commitment to excellence that has helped us become a worldwide leader in fluid purification and dehydration technology. © HENEK Manufacturing Inc. 2019. HENEK® is a registered trademark.